Asuka and Shinji: "It's all Misato's fault. We have to eat, breathe and sleep together!" Of the growing number of anime series I have been watching over the past several months, each one has something unique to offer and, while some are better than others, I haven't found many lemons yet. Evangelion was one of the first TV series I discovered as a dOc reviewer, and it continues to impress, though I think I should tone down my recommendations for these shows so some of my colleagues here won't be so eager for the review copies! It isn't hard to see why the series is so popular, as it combines decent action sequences with a continuing storyline and plenty of humor, with a bit of fan service thrown in for good measure. The action continues as Angels persists in their attack on Japan, in disc three of the 8 installment Neon Genesis Evangelion set. Three episodes are contained on this disc: Both Of You, Dance Like You Want To Win!, Magma Diver and The Day Tokyo 3 Stood Still. With remnants of the last Angel still lying in the streets, NERV is busy incorporating their latest acquisition, the first production model Eva, into their defense against the Angels. The new girl at school is driving the boys crazy, but for Shinji it's not because of her devastating body. Asuka Langley Sohru (Yuko Miamura) is the new Eva pilot, imported from Germany, and she's been making his life miserable since they first met, due to her highly arrogant nature. To make matters worse, after an embarrasing defeat at the hands of the latest Angel, she has been moved into Shinji and Misato's home, something neither Shinji or Asuka are all too happy about. To really top it all off, they are now expected to train together in order to defeat the latest threat on Tokyo 3. Misato is not too happy with the company Asuka brought with her, in the form of Misato's former boyfriend, who is overseeing the transfer of the German built Eva 2 to Japan. Ryoji Kaji (Koichi Yamadera) is no stranger around NERV headquarters, also trying to get cuddly with Ritsuko Akagi (Yuriko Yamagichi). Meanwhile the First Child, Rei, is being kept in the background as Asuka tries to take charge of the Eva team. As preparations for their combined attack on the 7th Angel come closer to the deadline, the fighting spirit isn't the only thing being awakened in Shinji's world. The introduction of Asuka in the previous disc has really sparked the humor level in the series a great deal. Her cocky attitude gets her into trouble, though she is able to come through in a crunch. Shiji's friends are all jealous again, now that he is living with not just one, but two babes they are drooling over. Shinji manages to inadvertantly catch glimpses of the girls in semi-undress, which is cause for great embarrassment, though they don't seem too phased by these indiscretions. The politics behind NERV begin to be exposed, and it's clear that not everyone agrees with their plans. Misato has to make some adjustments to her lifestyle as the heat comes down on her to make sure there are no more repeats of the defacing loss they had just encountered. The characters continue to get more interesting, humor is abundant, and we get a good showing of the mechanized Evas in every episode. This is an easy recommendation for anime fans. Image Transfer Review: Another nice looking disc. A bit of interlacing, a few instances of aliasing, but otherwise a pretty good presentation. Colors are strong without being overbearing, and any other defects look source-related, though at three episodes per disc I would hope the quality would be pretty high. Audio Transfer Review: There is something just plain wrong with being able to watch anime in French or Spanish - English is bad enough! However, despite my feelings on the subject, ADV has chosen to include dubs in all three languages, in addition to the original Japanese track, which sounds fine with no distortions or other defects. Sampling the other tracks indicates a pretty consistent quality throughout. Extras Review: The disc opens with a standard selection of previews, which are also accessable from the menu, though not individually. Farscape, Shadow Raiders, Orphen, Arc The Lad, Nadia, and the ADV preview mix. ADV has added an additional chapter stop for the preview, which I prefer over having the end credits and preview combined. Like the last disc, the closing song is a different version than on earlier episodes. A collection of character profiles are included as single screen overviews, with only limited spoiler potential once you've viewed the disc. This disc came in a Scanavo that did not want to let go of the disc, which while not as good as an Amaray, is far better than the Protect Case that my disc 2 came in— it practically threw the disc at you when you opened the case. Once again, ADV has altered the spine art so it isn't consistent with the previous two discs in the series. Grrrr...! 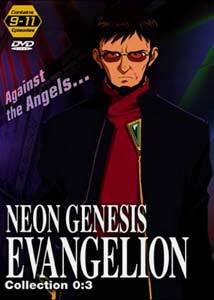 Through viewing the first three discs in this series, Neon Genesis Evangelion rates as an easy recommendation: fun, engrossing and exciting. Though the complete series does represent a reasonable investment, the re-watchability factor is high, and the disc quality is very good. Not quite as wacky as Nadesico, nor as deep and involved as Gasaraki, Evangelion belongs in any serious anime collection.